ETHANCOOPER/PIONEER In his speech on campus April 16, former Gov. George Nigh outlined his strategy in the Legislature to replace an earlier tune with the Rodgers and Hammerstein version of “Oklahoma” so widely known today. “Oklahoma!” was not always the official state song, although it’s the only one most OCCC students have ever heard. 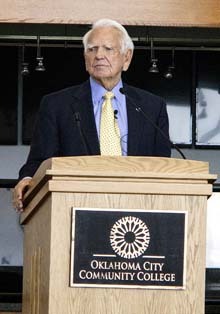 In his speech on campus April 16, former Gov. George Nigh outlined his strategy in the Legislature to replace an earlier tune with the Rodgers and Hammerstein version so widely known today. He thought the song “Oklahoma!” portrayed the beauty of the state. This was said during his Public Affairs Forum speech in the Visual Performing Arts Center atrium. Nigh, at age 87, was the second in a series of former Oklahoma governors slated to share their experiences in office with students on campus. Nigh described a time when he was listening to the number one hits on the radio in 1943. “Wow! The number one song they were singing was about — our state,” Nigh said. Immediately he thought that should be Oklahoma’s state song. Nigh was a member of the Legislature in 1953. He described the great lengths he went to in order to convince other legislators to pass the bill for the state song, knowing that he would be displacing an existing song written by a pioneer that was a sentimental favorite with traditionalists. Nigh brought in Ridge Bond from Tulsa, who had starred in the Broadway production of “Oklahoma!,” to sing the tune to the lawmakers after the Oklahoma College for Women’s choir sang other pieces from the musical. It had the effect he had hoped for. “And that’s how I passed the bill,” Nigh said. He said he believes the state song has enhanced Oklahoma’s image around the nation and the world. “Image is important,” he said. Nigh served as lieutenant governor for 16 years and as governor four times. He said he had served twice as interim governor, for a total of 14 days, before he was elected in 1978 and served two terms, a total of eight years. Nigh told how former speaker of the U.S. House of Representatives, Carl Albert, once recommended him. “I endorse George Nigh for governor of Oklahoma,” Albert said. OCCC Vice President Jerry Steward said Nigh was loved by the people during his time as governor. During Nigh’s election, he carried all 77 Oklahoma counties. “He is the only governor in our history that has carried all 77 counties in an election,” Steward said. Nigh’s concern for “image” and “reality” was a theme he came back to. OCCC will have another Public Affairs Forum in the fall semester featuring former Gov. Frank Keating. For more information go to occc.edu/paforum or call 405-682-7590.